We have excelled in the business of manufacturing, exporting and supplying Pelvic Plates. 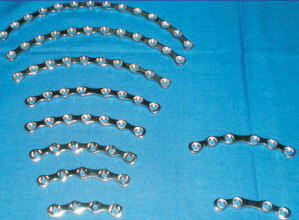 The Pelvic Plates provided by us are widely used for the pelvic region of the body. Made using the finest grade raw materials, our Pelvic Plates are compatible with the body temperature and are safe to use as well. Further, the clients can avail these Pelvic Plates in different specifications, at market leading prices.